Actor Chris Evans, of "Captain America" fame, retweeted a video of Frida at work, adding: "What did we do to deserve dogs?" 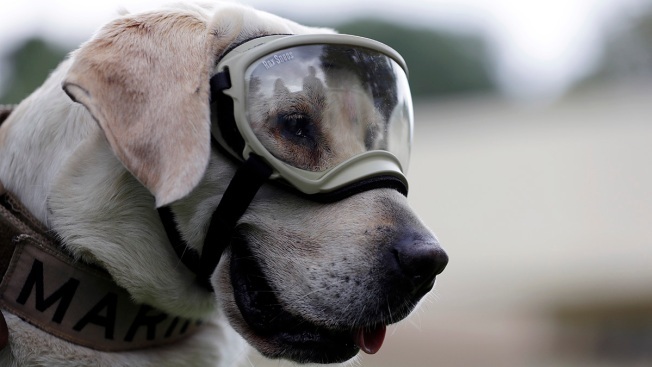 Even without rescuing anyone from the rubble after Mexico's big earthquake, a photogenic yellow Labrador retriever named Frida has gained an international social media following. Clad in goggles and neoprene booties, Frida, with nose to the ground and clambering over crumbled buildings, became a symbol of hope. "In social terms, this dog functioned like a transitional object because maybe she didn't help us in anything real or concrete — meaning she didn't rescue anyone — but she let us feel like there was hope and that there were things that could help us," said Fatima Laborda, a psychoanalyst and director of Casa Grana, a psychological assistance and research organization. Laborda said Thursday that in traumatic situations, whether war or natural disaster, people tend to seek refuge in something real or symbolic as they try to regain confidence and a feeling of safety. A rescuer literally removing rocks to free you is one way to feel helped, but someone can also "feel supported by merely seeing people in the street, because that way I feel the solidarity of everyone else and that is symbolic and also can give me psychological relief." The earthquake that shook Mexico City and nearby states was not even Frida's first in September. She was previously dispatched to Juchitan, a town in Oaxaca state that sustained much damage in the magnitude 8.1 quake that struck southern Mexico on Sept. 7. But she didn't reach celebrity status until Mexico's most recent disaster when the Mexican navy — Frida's employer — released a video of her at work on its Twitter account. Frida's star rose just as another symbol of hope dissipated. For two days eyes were glued to search efforts at a collapsed school where including 19 children and seven adults died. Word spread that a girl named Frida Sofia was trapped in the rubble. But ultimately, the navy announced that she had never existed. No one resists Frida's charms, including her two handlers. One of them, Emmanuel Hernandez, a marine corporal, said Frida was identified early on for having qualities of a good search dog: docility, a good instinct for hunting and strong sense of smell. Hernandez tamped down rumors that Frida's retirement might come soon. She remains capable and ready to work, he said. "If someone asks me if I would want to take Frida, I would say yes," Hernandez said. "But we will have Frida for a long time yet."